Asphalt shingles are so common on roofs today that it is hard to imagine roofing before these shingles became popular. However ubiquitous they are today, asphalt shingles didn’t begin to be widely used for roofing until the early part of the 19th century. Let’s take a look back at the history of the development and evolution of asphalt shingles. The style of asphalt shingles that are used today actually evolved from an earlier, mid-19th century style of roof coating. Around 1840, a roofing material was developed that used layers of felt saturated with coal tar. This material was produced as a rolled sheet, as the Canadian Asphalt Shingle Manufacturers’ Association notes, and the surface of the tar-soaked felt was covered with ground shells or sand to form a protective layer. Around the turn of the 20th century, this rolled felt roofing material began to be cut into strips to form individual shingles. Cutting the tar-saturated felt into shingles made it easier to handle and install. This development was the predecessor to today’s asphalt shingles. Through the early part of the 20th century, the process for manufacturing shingles continued to evolve. 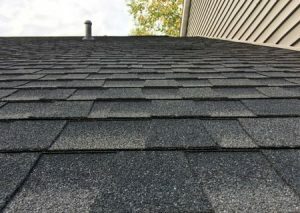 The coal tar that was originally used to saturate the felt was replaced with asphalt, and throughout the middle of the 20th century, various attempts were made to improve the wind resistance of these asphalt shingles. The first attempt used a diamond cut pattern, which later evolved into shingles designed to be placed in an interlocking configuration. By the 1950s and ’60s, the original rag felt was replaced with a cellulosic felt, while additional color options and single strip shingles started to appear on the market in the 1960s and ‘70s. Modern asphalt shingles continue to build on this history that dates back to the 19th century. Today, asphalt shingles are offered in two primary styles. These are dimensional or architectural shingles and the more traditional three-tab shingles. Another modern development is that the organic felt that was used as a base for asphalt shingles for several decades is being replaced with a fiberglass base, while new laminate shingles are offering even greater protection and waterproofing. Modern shingles are more durable and reliable than ever, and today’s three-tab shingles may last 15 years or longer, while architectural shingles may last 30 years or more. Of course, a professional installation is essential for a roof to perform as expected. At Roofing by Bruce, we are experienced in installing roofs that will hold up to winter in the Poconos. We use a Nor-Eastern nailing pattern that provides additional resistance to the sever ice, snow, wind and rain that’s common in this part of the country, helping ensure your roof lasts through anything that nature throws at it. Contact us today at 570-424-7250 to learn more or to request a quote for a roof repair or replacement.